Begin by debriding necrotic tissue and slough. If debridement is not needed, begin by washing thoroughly with water and an antimicrobial soap. 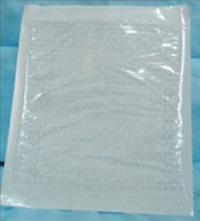 Simply pat dry excess water after cleansing, leaving surface wet or rinse wound clean with normal saline and leave wet. 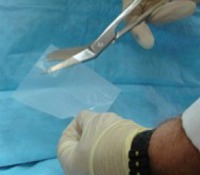 Dermafill comes in a sterile envelope. The dressing has a slightly opaque quality, becoming crystal clear upon application. 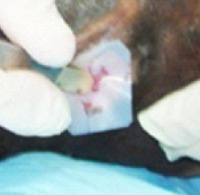 Dermafill should be removed from the package and cut to fit, allowing approximately 1 cm overlap. Place the Dermafill on the wound site and gently work out any air bubbles beginning at the center of the wound. When the Dermafill comes in contact with the wound, it becomes clear. Areas that remain opaque represent air bubbles. Also, areas where the tissue is not injured and/or areas of overlapping Dermafill. Once placed over the wound, Dermafill becomes completely clear. 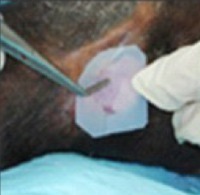 Some clinicians prefer to cover Dermafill with a secondary dressing, though it is not recommended. 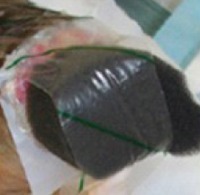 Dermafill has been placed under compression and vacuum assisted dressings. Dermafill helps to control bleeding and reduces the accumulation of exudate. It will also work on patients treated with blood-thinning medications. Dermafill is crystal clear when applied - the color of the dressing varies depending upon the composition of the material below it – the color and texture may change over time. The color of the exudates varies from individual to individual, sometimes appearing yellow, brown, or even green. Remember to treat the patient not the dressing. 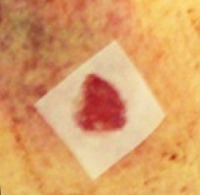 Blood in the exudate will frequently result in the dressing appearing dark red or black in color. Transpiration occurs over time, allowing the accumulated exudate to dry, forming a semi-rigid outer covering. 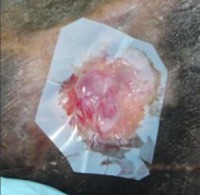 This covering accelerates the healing process, providing a rich moist environment at the surface of the wound while the rigidity facilitates the migration of the cells. Dermafill's semi-rigid structure also reduces the affect of mechanical stresses associated with serial debridement and dressing changes. 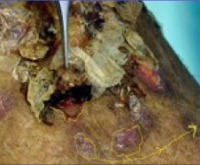 By reducing dressing changes, the wound becomes less likely to be inoculated with infectious agents. Dermafill autolytically debrides itself by becoming dry and lifting itself off as the wound heals. Wounds do not heal uniformly, thus DermaFill liberates itself in a non-uniform pattern, releasing itself only when the wound is 100% healed. 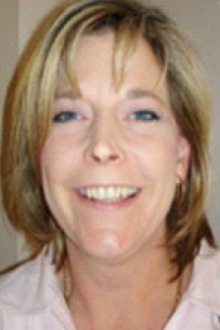 The appearance has been found to remind one of the way a persons skin peels following a sun burn. 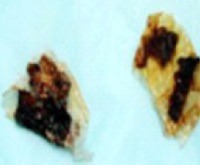 Dermafill resembles a natural scab that forms over a wound and falls off by itself when the wound is COMPLETELY HEALED. 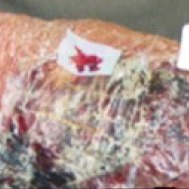 Do not attempt to help this process along by removing the dressing prematurely. 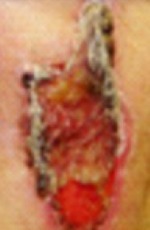 If the Dermafill becomes prematurely dislodged from the wound, simply patch the open area with a new piece of DermaFill, leaving the old dressing still intact in place. If it becomes necessary to remove the Dermafill before complete healing takes place, simply cover the area with a piece of gauze soaked with saline and allow it to sit until the Dermafill softens and then remove. * Dermafill is prescribed PRN. However, in most cases, Dermafill needs no additional dressing changes.